Part of the reason we’ve remained focused on the MeeBlip project is to get into the process of how to make that kind of jam as accessible as possible. It’s not just limited to that – I spoke with Morton Subotnick about how he used voice input on modulars to make Silver Apples on the Moon as immediate as singing. When Novation made starting music the theme of a recent campaign, echoing the way Ableton first described Push, a number of people I talked to confessed that finishing music was more of a challenge than starting it. But I think if the initial spark has some character, finishing is far easier. I recently stopped by the home of Oliver Greschke, developer of Elastic Drums for iOS, to play with a mobile jamming rig. Our jam session isn’t necessarily great music – something about cameras rolling drains any creative impulse out of my brain. But we did get to experiment with the way the setup is working. 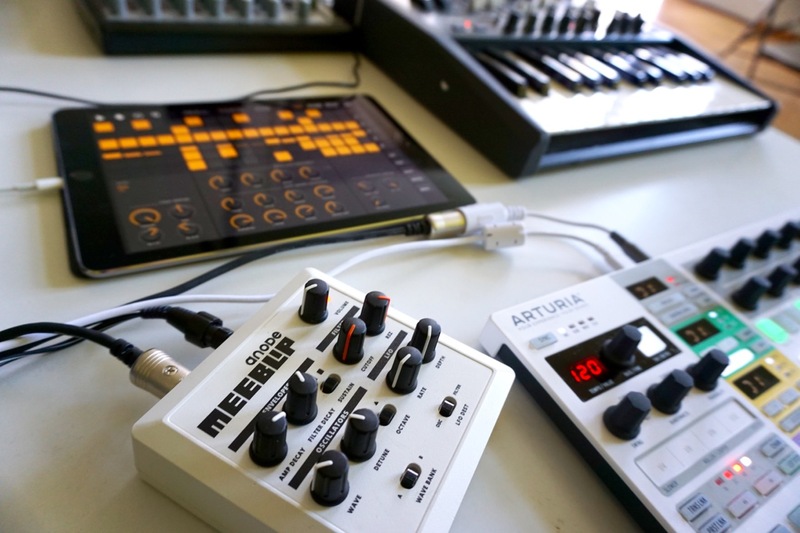 Arturia’s BeatStep Pro is fantastic in that it immediately offers three handy layers (for melodies, drums, etc. ), and both step-by-step programming (with display) and live programming (with the pads). Elastic Drums here serves as the clock source. 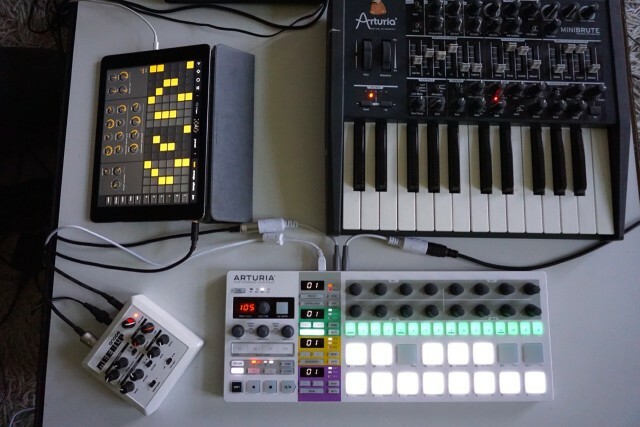 Now, the absence of MIDI thru on our gear means a thru box would be a good idea – makers like Kenton have you covered there if you don’t have a multi-port MIDI box (that’ll do, too). And Elastic Drums is a perfect companion to the MeeBlip basslines, jumping in on drums. It’s a bit bigger (so maybe “mobile” isn’t right), but we added an Arturia MiniBrute, too. Now, to be fair, none of these sorts of instruments gives you open-ended sound possibilities. 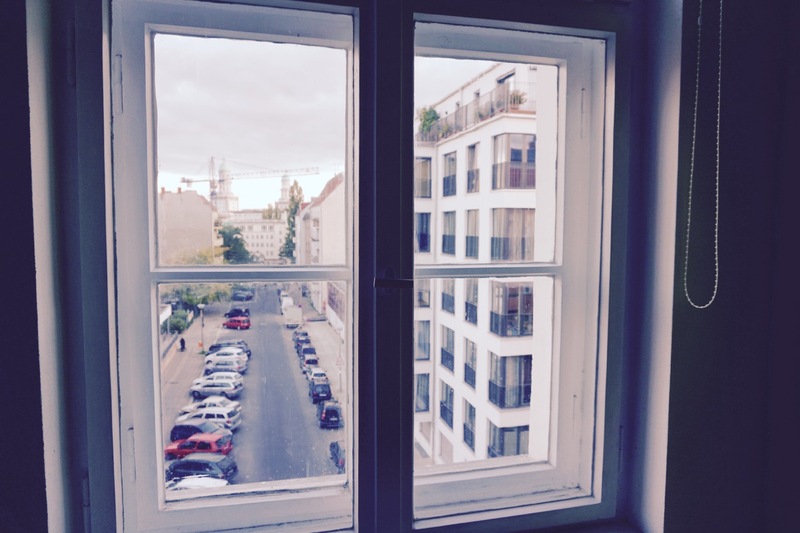 But then, it can be a lot of fun to push against those limitations, too. The BeatStep Pro and Novation’s just-released Circuit are clear rivals to doing the job (though you could even use both). Circuit does built-in sounds, and BeatStep Pro doesn’t, but the Arturia piece is also a more advanced dedicated sequencer than Novation has built, accordingly. 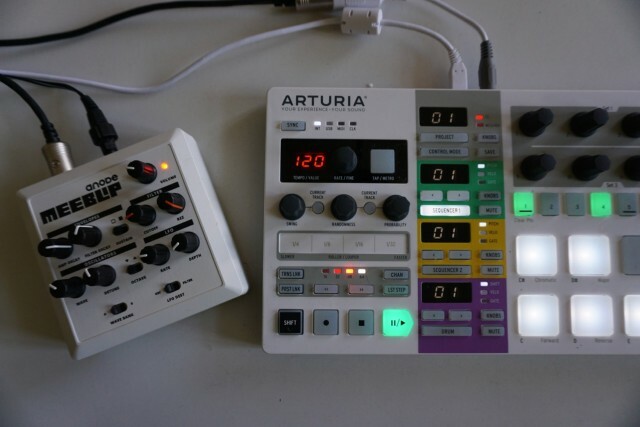 (MIDI is more flexible from the Arturia, and it adds CV.) I’m waiting on some more details of Circuit’s implementation, but we’ll get to look at this. What’s been nice about working on the MeeBlip is watching all the jam videos come in, unsolicited, from users. That now includes our soon-to-run-out-forever limited edition model. Some details there: you’ll spot the Audiobus connection panel on the iPad, running quite a few apps. (From our MeeBlip Facebook page, he reports “If I remember correctly there were some Aufx apps involved (Space, EQ and Push for sidechaining the Meeblip to the PO), Arpeggionome for sequencing and Tonestack to roughen the Meeblip a bit and probably some more apps i didn’t use in this snippet smile emoticon.” Whoa. Also, talk about mobile: a 9V battery block can battery-power the MeeBlip so it’s entirely mobile. What does your mobile rig look like, if you’ve got one? What do you like to play with when playing with friends? Let us know in comments.